First responders transfer patients from ambulances to Broward Health Medical Center in Fort Lauderdale on the afternoon of Feb. 14. The hospital was on lockdown after receiving victims of the shooting at Marjory Stoneman Douglas High School. Police patrol the hospital on Feb. 14 as staff members were treating shooting victims. Reporters gather at a media staging area outside the hospital, waiting for updates about shooting victims. On the afternoon of Feb. 14, Fawn Patterson got a call from her daughter telling her to come to the hospital. Amanda Ray Carrillo was pregnant with her fifth child, and she was bleeding. She’d been admitted to Broward Health Medical Center in Fort Lauderdale the day before but hadn’t gotten answers yet about what was wrong. She wanted her mom to be there when the doctor came to explain. When Patterson got to the hospital, there was a security guard blocking the door. The facility was on lockdown after receiving several victims from Marjory Stoneman Douglas High School. Earlier that day, a gunman had opened fire at the school and killed 17 people and injuring another 17. Listen here to the audio version of this story. Patterson was one of dozens of family members and friends waiting outside the hospital to see loved ones who were being treated for medical concerns unrelated to the shooting. And in the hours after the massacre, there was a lot of misinformation and a lot of fear. Hospital administrators in Broward County — and in Orlando, where medical professionals treated victims of the mass shooting at Pulse nightclub a year and a half earlier — said enhanced security protocols like lockdowns are standard when victims of violence are being treated. They argued it’s necessary to keep all patients and staff safe. From left, Benny Menendez and Louis Yogel are directors of Broward Health Medical Center's emergency department and medical staff, respectively. They briefed reporters on the condition of shooting victims during a news conference outside the hospital on Feb. 14. But for people caught in the middle of the chaos, the lockdowns were distressing — and they demonstrated the far-reaching ripple effects of a mass shooting on an entire community. Patterson, who lives near Port Everglades, stood around on the sidewalk and in the parking lot, talking to a few other people who were in the same situation and reporters who were arriving at the hospital for updates about the shooting. No one knew why they couldn't go in. They had been talking over the phone. Carrillo’s husband, Roberto Gonzalez, and their children, were in a hospital room with her watching news coverage of the shooting on television. Gonzalez said they heard that the suspect was being brought to the hospital where they were, in Fort Lauderdale. He went downstairs to try to find out more but was told to return to his wife’s room and stay there. He said he noticed the increased security and was comforted by it. Outside, Patterson also believed the confessed shooter, Nikolas Cruz, was at the hospital and that was why she wasn’t allowed to go in. Later, it was announced that Cruz had been treated briefly at another hospital in the system — Broward Health North in Deerfield Beach — and then released to police custody. People outside were confused and upset. From left, Shoshanna Campbell, Fawn Patterson, Joedonna Harrison and her daughter, Jayanna, sit on a concrete block in the parking lot of Broward Health Medical Center on Feb. 14. They were kept from visiting loved ones being treated inside because of a lockdown related to the shooting. As the afternoon turned to evening, and Patterson wondered if she should keep waiting or head home, she sat on a concrete block in the parking lot with two other women who were also hoping to get into the hospital. They laughed and remarked: After three hours of waiting together, they were friends now. Joedonna Harrison was there with her daughter, Jayanna, and her friend Shoshanna Campbell. A close friend and co-worker of theirs, Beverly, was suffering from cancer and had been told she didn’t have much longer to live. Harrison, of Lauderdale Lakes, said Beverly — they didn’t want to say her last name — was like her mom. The women had a clear glass vase and a flower pot wrapped in pink paper with white hearts on it — both containers filled with pink tulips — sitting next to them on the blacktop. The flowers were from their other colleagues. Harrison lamented that they had already started to open, and her little girl said they looked like they were dying. Campbell, who also lives in Lauderdale Lakes, said she worried what might happen if she had to come back the next day. “If I don’t get to see her today, I don’t know if I’m gonna get to see her,” she said. “I feel bad for the parents and the situation. It really dawns on me, too,” she said, referring to the shooting. The number of victims had just been announced. “It’s just a sad evening overall,” she said. The lockdown began at around 4 p.m. A few hours into it, tensions were running high, and people were crowding the entrance of the emergency room trying to persuade staff to let them inside the hospital. Porcha McIntosh waits outside the door of the emergency room at Broward Health Medical Center in Fort Lauderdale. For hours, she wasn't able to get inside to be with her newborn, who was in the neonatal intensive care unit. “I have no words. I’m just lost,” said Porcha McIntosh. She lives in New York but had been in South Florida visiting family when she gave birth prematurely. Her newborn son, Calieb, was suffering from choanal atresia, which means his nasal passages weren’t fully developed. She wouldn’t budge from the door, in a near state of panic. “Anything that happens, … I have no way of knowing,” she said. Her phone was dying. At around 7 p.m., a hospital staff member told security guards they needed to clear the doorway, because there was about to be a shift change and a lot of workers would be coming in and out. After the transition, there was a different person guarding the door. McIntosh said the staff member escorted her inside to be with her son. She stayed there with him the rest of the night. At one point, a spokeswoman for the hospital told reporters the lockdowns in place at both the hospital in Fort Lauderdale and the other one in Deerfield Beach would be in effect until 8 a.m. She said later they ended up lifting them at about 9 p.m., after five hours. Patterson had already gone home. 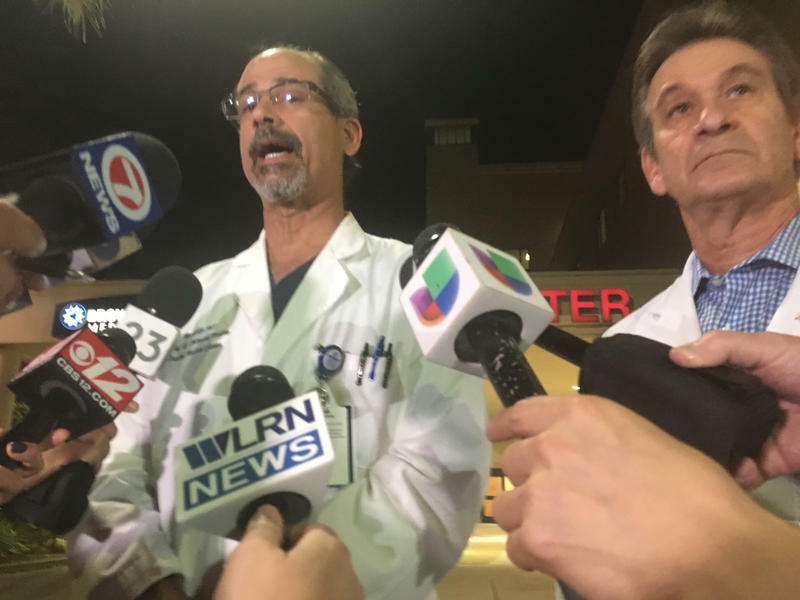 When it was starting to get dark, two doctors who helped lead the Fort Lauderdale hospital’s response to the shooting emerged to provide an update to reporters. Seven victims of the school shooting had been taken to that hospital. The other one, Broward Health North, is about 12 miles from Marjory Stoneman Douglas, and it received nine patients — including Cruz. He was treated for breathing difficulties and then released into police custody. The lockdowns continued after Cruz had been arrested and was no longer in the hospital's care. Benny Menendez, chief of emergency medicine at Broward Health Medical Center, said then that it was a precaution. “Nobody should come in or come out [of] this institution until we make sure that the perimeter is clear and nobody will come and attempt anything else,” Menendez said. The doctors stressed the hospital was still "open for business" — people who needed medical treatment were not being turned away. Also, Menendez said family members of the shooting victims were being kept informed inside the hospital. Jennifer Smith, a spokeswoman for Broward Health, said later it was "standard protocol when working with law enforcement during an active investigation" to allow family members of victims in the hospital, even during a lockdown. The head of security at another major Florida hospital network agreed. “Being in a posture of prevention is just the best way to do business,” said Bryan Margeson, corporate security manager for Orlando Health. The private hospital chain treated victims of the Pulse nightclub shooting in June 2016. Margeson said when a mass casualty incident is the result of violence, hospital administrators worry about worst-case scenarios — like a suspect coming to the hospital to further harm victims, someone trying to retaliate against a perpetrator or big crowds of people rushing emergency rooms. So when there's a crisis at his hospitals, security guards patrol the entrances, questioning people about why they need to come in. If they’re not there for medical care, they’re not a high priority. “Our first and foremost responsibility is treating the patients, and that overrides everything,” he said. Margeson likened preparing his hospitals for potential problems after violent incidents to seeing a tornado warning on TV and bringing your patio set inside. Amanda Ray Carrillo and Roberto Gonzalez pose with their fifth child, Amaya Gonzalez, a few hours after her birth on April 16. Carrillo was experiencing complications with her pregnancy and was being treated inside the hospital during the lockdown on Feb. 14. McIntosh, whose premature baby was in the neonatal intensive care unit, was released from the hospital about three months after his birth on Dec. 29. She said he’s doing better but is still breathing with a tube in his throat. Carrillo’s complications with her pregnancy turned out to be not too serious. She was treated and released from the hospital the day after the shooting. Two months later, she was back — to have her fifth child. Amaya Gonzalez was born on April 16 — eight pounds, 13 ounces, and 21 inches long. This time her mom was by her bedside. When Meadow Pollack died, she had nine bullets in her petite body. The Parkland shooting victim was one of 17 students and educators killed Feb. 14 when confessed gunman Nikolas Cruz shot up the halls of Parkland's Marjory Stoneman Douglas High School with an assault-style weapon. Not far away was Scot Peterson, a Broward Sheriff’s Office deputy and Stoneman's school resource officer who heard the shooting, but stood outside the building as Cruz opened fire on his classmates. 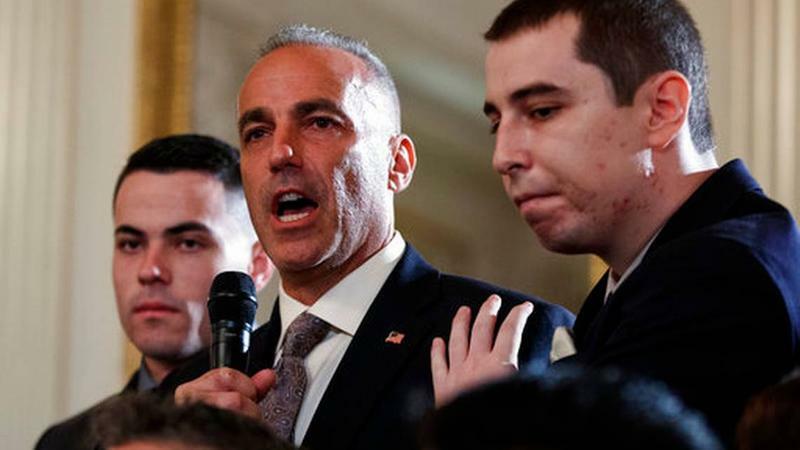 Parents of teenagers who were murdered on Feb. 14 at Marjory Stoneman Douglas High School asked a commission tasked with investigating the massacre to report any findings that could help make schools safer as quickly as possible.